The demands of content marketing can be brutal. As soon as you end one campaign, another one starts. The pressure of continually coming up with fresh ideas and then actually finding the time to write the content is too much for most to handle. Couple that with the demands of driving traffic back to the content with carefully developed marketing tactics – suddenly, you don’t have time for anything else in your life. But the need for content marketing is clear. It’s impossible to remain competitive without it. So what gives? How can you reap the rewards of content marketing without spending so much time on it that other areas of the business suffer? 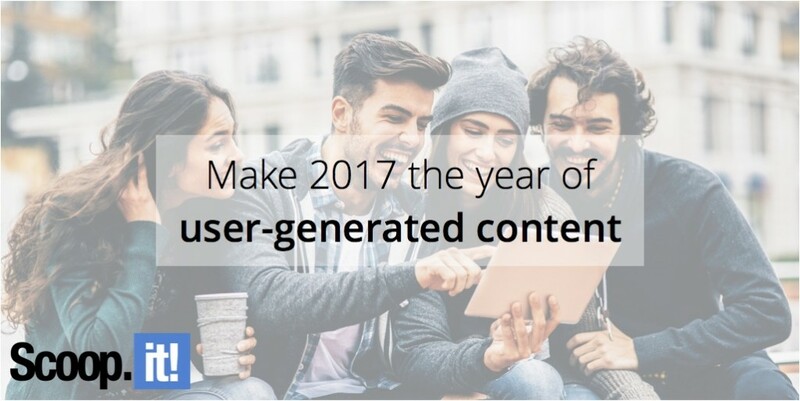 The answer is user-generated content and 2017 is the perfect year to give it a try. User-generated content isn’t something new, but it’s being relied on by more and more brands as a way of simultaneously relieving pressure and enhancing trust within the marketplace. While you can’t halt your content marketing efforts and rely solely on user-generated content, there are many benefits to be enjoyed from blending these two to create a well-rounded content strategy. Specifically, you can humanize your brand and enjoy a noticeable bump in trust. “Some of the most effective salespeople that you have are your own customers and allowing them to narrate your brand’s success stories might just be the spark that your content campaign needs,” says Morgan McAbee, a PR assistant for Revcontent. The concept of user-generated content is pretty easy to understand. The actual process of developing and executing a user-generated content strategy is a bit more challenging. Here are some things you can do to make the process a little easier. User-generated content works because it reaches your customers where they are. This also means it’s totally useless if you’re using the wrong channels or platforms to publish content. The very first thing you need to do is find out where your customers are spending their time online. Sure, you’ve got customers spending time on thousands of different websites, but where are they spending the majority of their time? People who prefer Facebook are different than those who hang out on Instagram, and vice versa. If you don’t adequately identify preferences, then you won’t be able to maximize your reach. Sprout Social has a pretty good guide on the differences between various social networks and which user-generated content formats work best on each. Go ahead and bookmark it for future use. One of the keys to a successful user-generated content strategy is to build anticipation. This is the only way to attract people and garner enough submissions to make it worth your time. If you’re sending out an email asking people to submit a 500-word essay in return for a 10 percent off coupon, you’re probably not doing enough to get people engaged. There’s literally no excitement in that offer. On the other hand, if you’re using social media to ask followers to submit images of them and their friends on spring break for a chance to win a week-long summer vacation in Key West, you’re going to get a lot more traction. Participation is almost always directly connected to anticipation and excitement. It’s easy to get excited when you see user-generated content start to pour in, but just because someone submits something doesn’t mean you need to use it. Just as you would never willingly publish a low-quality blog post that someone on your time quickly typed up in order to fill space, you shouldn’t publish poor user-generated content simply because you have it. The most successful user-generated campaigns are the ones that selectively choose the best of the best. Not only does this communicate to your fans that your brand is committed to quality, but it also raises the bar when it comes to future user-generated campaigns. You wouldn’t invest your time and money into content marketing if there was no reward waiting for you at the end, would you? Well, your fans aren’t going to take the time to create content for your brand if there’s no benefit. Successfully encouraging a large number of participants and submissions will require you to offer a tantalizing reward. It could be a free product, generous discount, or even a job offer. There’s value in developing a unique user-generated campaign, but you can learn a lot by studying successful examples from the past. One of the greatest examples is the Starbucks Partner Cup Contest, which asked customers to decorate the company’s iconic cups with hand-drawn art and share the image via social media. They received thousands of designs, got a lot of free PR, and were able to generate buzz around something as simple as a paper cup. You can check out some other good examples here. Getting people to buy-in to your user-generated content strategy isn’t easy, but the timing couldn’t be more perfect. Thanks to social networking sites like Instagram and Snapchat, the average internet user has an understanding of what it looks like to produce content (through one medium or another). By tapping into this “creator” mentality, you can draw people in and encourage them to get involved. 1 Comment on "Make 2017 the year of user-generated content"
Do you think offering free ad space is a good method to entice user conten?